11728 RA1911.jpg 500X638\RA1911.jpg 38233 RA1911_1.jpg 500X638\RA1911_1.jpg 16504 Zoom Packaging.jpg 500X638\Zoom Packaging.jpg Send A Hint! 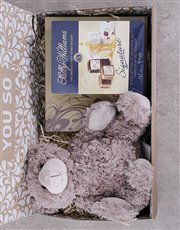 Product Description: less text A cute cuddly tan teddy with a 595g of Sally Williams Masterpiece collection, a 170g Sally Williams Signature nougat collection,12x single assorted sally Williams nougat pieces, Send this cute gift to someone special. Get this Teddy And Sally Williams Chocolate Gift delivered with NetFlorist.